Warwickshire fast bowler Olly Stone is finally close to making his Bears debut after a year out with the knee injury he suffered with Northamptonshire prior to his winter move to Edgbaston. And the ex-England Under-19s captain is so keen to recharge his career that he will tone down the wicket celebrations that caused his freak injury. "I've had jokes about whether I'm still going to celebrate wickets," he said. "I might go back to an old-fashioned handshake, then I won't get injured." It is now over a year since Stone suffered his injury, celebrating the prize wicket of Worcestershire's Moeen Ali in a T20 Blast group game win for Northants at Wantage Road. 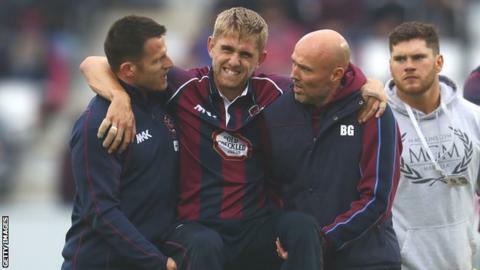 Stone's knee injury - which damaged his anterior cruciate ligament and cartilage - cost him the chance of a winner's medal, as Northants went on to win the trophy at Edgbaston. But that was a month after Stone had already revealed his intention to move to Edgbaston himself - on a more permanent basis, having signed a three-year deal with the Bears. Stone's long-awaited Bears debut is now finally getting closer, just in time for the start of this year's T20 Blast, which starts on 7 July. His first public appearance came on Friday at Cricket Meadow, Bridgnorth, where he sent down four overs in the first of two back-to-back Birmingham Bears T20 friendlies against Shropshire. "It was nice to finally get back out there on the park," he told BBC Sport. "It was only four overs, but it was three weeks ahead of schedule. "It's been just over a year. At times it's gone quickly. At times it's gone slowly. It almost felt like I had to learn how to walk again. You realise just how much you take for granted. "But I'm happy where I am now. I'm not the sort of person to get down about it. It happened, but it was just one of those freak injuries. I'd celebrated wickets like that loads of times before. It was innocuous." Eight other counties made approaches for the much-admired Stone, who took exactly 100 wickets in his five years with Northants, spread over all three forms of the game. And he is itching to get going to not only rejuvenate his own career, but help boost the Bears following their poor start to the season. "I've got to build up my fitness, get back ready and try to take as many wickets as I can, in whatever format they want me to play," he added. "It's not been an ideal start to the season but all the lads are sticking together. We're doing the right things and just hope that the luck will change. If I can play a part in that, it would be great for me and hopefully for the team too." Warwickshire, county champions in 2012, are bottom of Division One, now 20 points adrift of safety, following their third innings defeat in five games this season, against Hampshire. They are currently on a 14-day break from action as they were eliminated from the One-Day Cup at the group stage, finishing bottom, and do not play again in the Championship until Monday, 19 June when they go to Chelmsford to face Essex. But they will at least have veteran spinner Jeetan Patel back, following New Zealand's early Champions Trophy exit. Olly Stone's injury was sheer bad luck. He was bowling in a T20 against Worcestershire and had just dismissed Moeen Ali with a sharp bouncer. Stone leapt up in a big celebration and landed in discomfort. He seemed okay and tried to bowl another ball but collapsed and was carried off the field. It was a sad end to his Northants career having come through the academy. His slingy action and sharp pace added a real edge to their attack. Olly Stone was talking to BBC Sport's Ged Scott.